Age: 22 Height: 176 cm (estimation) Real name: Kannagi Kazuma (神凪和麻) Kazuma is a former member of the Kannagi household. He was banished from the family by his father after he was defeated by Ayano during the Successor Ceremony for the Enraiha, his family's sacred sword. Since Kazuma is a son from the main family, making him the legitimate successor, even his own father considered him a disgrace for lacking the power to use fire magic, his family's specialty. Four years later, at the age of twenty-two, he returns to Japan as a skilled master of the wind arts. Though he was not responsible for the killings in the Kannagi household that began to occur upon his return to Japan, he is still prepared to start a war with his former family. The Kannagi family quickly finds out that the meek and powerless Kazuma they once knew is now more powerful than any of them, which frustrates Ayano to no end. The secret to his new power is his status as a "Contractor", meaning that he has made a contract with the king of the wind spirits, making him one of the most powerful magic users in the world. 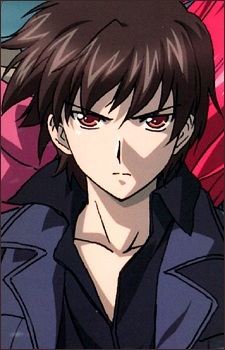 This contract manifests in a physical change which causes Kazuma's eyes to turn blue. Before being exiled from the Kanagi family, Kazuma was a kind, caring boy who only wanted his family's love, but after being cast out for being powerless, his personality took a dramatic turn. In the four years after his exile, Kazuma becomes much more cynical about the world around him, especially in maters concerning love, due in no small part to how his family treated him for being powerless. With his wind power, Kazuma tends to look down on members of the Kannagi family, finding it amusing and ironic that the very family who cast him out for being powerless, are now the powerless ones themselves compared to him. Some time after being cast out of the Kannagi family, Kazuma gets to know a girl named Tsui Ling, who beings to heal the emotional wounds of his heart. However, Tsui Ling is later sacrificed to a demon in order to resurrect it, despite Kazuma's best efforts to save her. It is her death that helps Kazuma forge his contract with the king of the wind spirits, ironically giving him the very power that could have saved her.